Often times, Christians just want a place to discuss things where EVERYTHING isn't "THE MOST PRESSING ISSUE IN THE UNIVERSE!" Sometimes you just want to talk about the basics of Christianity in a mellow environment. Well, THAT'S US!  Lutheran Stuff - NO DRAMA is the place to come when you just want to talk about all the awesome things in our faith without being treated like cannon fodder. We hope you enjoy our place. If you want to be a part of our growing family on facebook, just click Here to join.